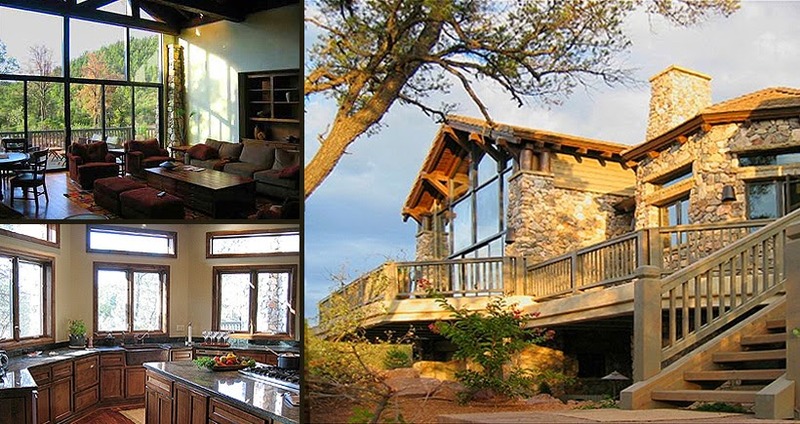 Place based Northern Arizona home design 'roots' to its site through the use of natural stone and heavy wood timbers. This place-based custom home was designed to fit into the landscape of northern Arizona and the Prescott National Forest. Based on the architectural legacy of Mary Colter and National Park Service style, the concept for the home was that of an old lodge that had been renovated for a modern-day residence. The home is rooted to its place through the predominant use of the natural materials found all around it- native stone and wood- for the columns, exterior wall finishes, and rustic wood beams that support its main roof. The Great Room itself features a full stone fireplace, a tongue and groove wood ceiling, and heavy wooden trusses overhead. A full height glass wall with 7' high telescoping glass doors opens to a generous wrap-around deck, blurring the lines between the interior and exterior and further connecting the home to its site. Catalyst Architecture completes construction drawings for 6,000 sq.ft. 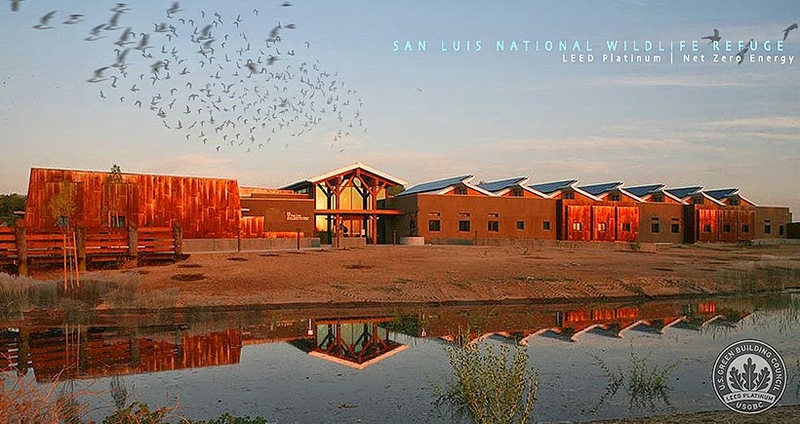 LEED-Silver Nature Center for Los Alamos County. 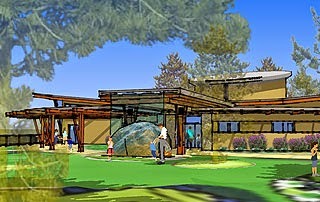 Catalyst Architecture has completed the construction drawings for the LEED Silver Los Alamos Nature Center project. The place-based energy-efficient design by principal Jeffrey Zucker features abundant natural daylight, rainwater harvesting, a thermally efficient building envelope, and roof-mounted photovoltaics. This 6,000 sq.ft. Design/Build effort is being led by Klinger Constructors, in association with Mullen Heller Architects- both of Albuquerque NM. The tenant and primary stakeholder for the project is the Pajarito Environmental Education Center (PEEC), which has been operating nature education programs about the Pajarito Plateau for a number of years. The project is set for groundbreaking the 1st week of May. Stay tuned for pictures of the construction in progress! "The building envelope was critical to the project's energy efficiency, Ackerman says, from the size, placement and specifications of the glazing, to taking advantage of natural daylight and ventilation opportunities, which help reduce the demand on the building's mechanical and lighting systems. One of the challenges for the project was the building orientation. "To reduce solar heat gain while still taking advantage of natural daylight for a building that is non-optimally oriented (along a north-south axis), we reduced the net glazing on the long east and west exposures of the building, and instead found opportunities to let in north light into the building's interior through the use of north-facing clerestory windows and 'wall monitors'," explains Ackerman." "A metal roof, combined with a rough timber frame and tall windows, was a natural fit for the refuge and the agrarian roots of the Central Valley region," Ackerman says. 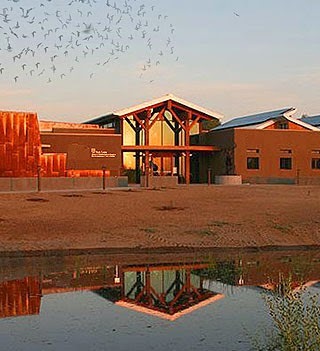 "The inverted roof design over the administrative wing of the facility is symbolic of the wings of a bird in flight, which interprets the refuge's role as a vital migratory stopover point along the Pacific Flyway for large concentrations of waterfowl, shorebirds and other waterbirds." "According to Matthew Ackerman, LEED-AP AIA, principal of Catalyst Architecture, the firm specializes in "place-based interpretive design," which means the architecture interprets, or "tells the story" of a place from its cultural, historic and/or physical characteristics. For this project, the firm interpreted a number of different aspects of the refuge through the architecture, leading to the choice of metal as an exterior cladding. "The architectural legacy of the Central Valley is largely one of agrarian buildings," Ackerman explains. They especially looked at a lot of the old barn structures that had tin metal roofs and metal siding. "We noticed that metal was a really common building material for the older barn structures in the region, just as the old wooden timbers were."